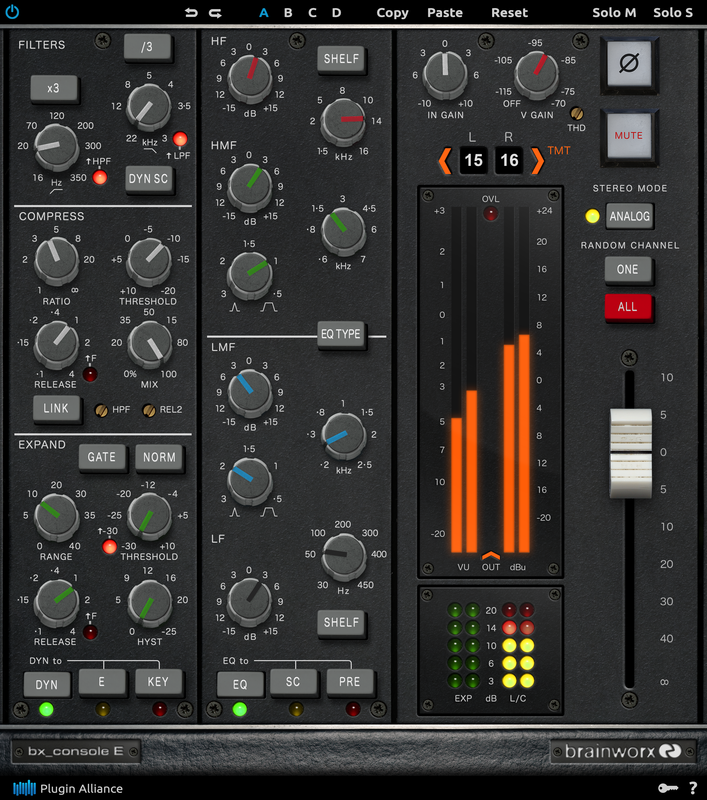 Brainworx’s brainchild is much more than a channel strip plugin with multiway routing, however; bx_console E uses patent-pending TMT (Tolerance Modeling Technology) to simulate the channel-to-channel variances of the E Series’ electronic components on each and every instance of the plugin. Put it this way: with 72 slightly different-sounding plugin channels collectively (re)producing all the complexity, depth, nuance, and width with which high-end analog consoles are held in such high regard — regardless of their hit-making heritage, the never-before-heard realism resulting from this trailblazing technology speaks louder than words, while an extremely low CPU (Central Processing Unit) load easily accommodates dozens of instantiations. But better still, bx_console E enables users to — on a per-channel basis — instantly swap the original console’s EQ revisions, substitute the compressor’s VCA (Voltage Controlled Amplifier) with that from the later-released British G Series console, and use contemporary Brainworx mods that greatly expand the functionality of the plugin way beyond what the original console is capable of. Of course this means that, in essence, engineers can create a dream hybrid mixing console with startling analog sound in the box by blending features of E and G Series consoles with modern functions from within the comfort of their DAW (Digital Audio Workstation). With the click of a mouse, users can recall a different E Series channel on each instance of bx_console E instantiated in their project, instantly producing that mixed-on-a-large-format-analog-console sound that is still so highly sought after today. That said, on any given plugin instance, another mouse click (of the EQ TYPE button) is all it takes to swap models of the very different-sounding ‘black’ and ‘brown’ EQ revisions for the analog E Series console, either of which can be placed before (PRE) or after (EQ) bx_console E’s dynamics section, or routed to its dynamics sidechain (SC); those ‘hot-swappable’ EQ revisions alone yield a selection of 144 different-sounding console channels to choose from! Further still, another mouse click substitutes a model of the pristine-sounding VCA from the later-released British G Series console’s compressor for the more colorful E Series VCA on any channel. 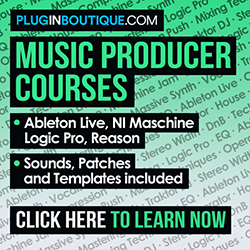 Both COMPRESS (compressor/limiter) and EXPAND (expander/gate) can be triggered by another DAW track routed to their external sidechain input, producing keyed rhythm tracks, ducked guitar fills, and other sophisticated effects. Extending bx_console E’s power and flexibility far beyond that of the original console and a typical channel strip, Brainworx Owner Dirk Ulrich and his award-winning development team have added a wealth of additional, modern functions to their meticulous models of the E Series’ vintage circuitry: a convenient MIX (dry/wet) control creates parallel compression effects; an optional secondary release time (REL2) control prevents the compressor from pumping on delicate acoustic tracks, while an adjustable HPF (High Pass Filter) for the compressor’s sidechain increases low-end power and punch on individual tracks, buses, and mixes; a continuously-variable THD (Total Harmonic Distortion) control adds colorful saturation and density to any plugin channel; two alternative THRESHOLD ranges for the expander and gate cover a huge 70 dB range, permitting processing of tracks barely exceeding -60 dBFS; an expander invert function facilitates only hearing the portion of the signal that will be expanded or gated, aiding setting the threshold; the gate’s HYST (Hysteresis) control sets a dedicated closed threshold up to 25 dB lower than the open threshold, preventing sustained guitar notes and ringing cymbals from making the gate stutter; the original E Series’ HPF and LPF (Low Pass filter) frequency ranges can be shifted by a factor of three, allowing for the creation of midrange bandpass filters; a continuously-variable V GAIN (Virtual Gain) knob adds simulated analog noise to any or all plugin channels for additional vintage vibe; comprehensive monitoring and metering sections include solos for mid and side channels, helping users to quickly hunt down undesirable distortion and phase problems on a stereo track or aux; and, last but not least, EUCON (Extended User Control) parameter mapping is provided for Avid controllers, including the flagship S6 control surface. download, and install only the products and formats needed for their system.